» The Evolution of the Car Washing Industry. Today’s automatic car wash systems are incredibly convenient. It’s easy to lose sight of how far car washes have come in so little time. Before the onset of the computerized, automatic car wash systems, everything was done manually. Let’s take a look at the evolution of the car washing industry. The first ever car washes debuted in Detroit in 1914. These were manual car washes that involved a lot. Customers’ cars were pushed in circles to multiple cleaning stations where they progressed through the stages of washing. In 1928, the Studebaker brothers in Detroit spawned the automatic car wash. These engineers envisioned a mechanism that would pull the cars through each cleaning stage. By 1946, this vision became a reality. The first ever semiautomatic car wash debuted in Detroit. Conveyors with moving tracks were installed in car washes to replace the dangerous hook conveyors. Cars were pulled along these new tracks by machines while being scrubbed with manually operated brushes. In the 1960s and 1970s, the car wash process progressively improved. Brushes with plastic bristles were phased out and replaced with sponges that were gentle to the car’s surface. Self-serve car washes also debuted. They allowed drivers to hire car spray guns, brushes, and brushes to clean their own cars. They could also use their own shampooers, foam treatments, fragrances, tire cleaners, spot removers and spot free rinses at self-serve washes. In the past couple of decades, there has been a movement towards fast, cost efficient car washes. The car wash industry understood that people were beginning to lose interest in full-service conveyor washes. 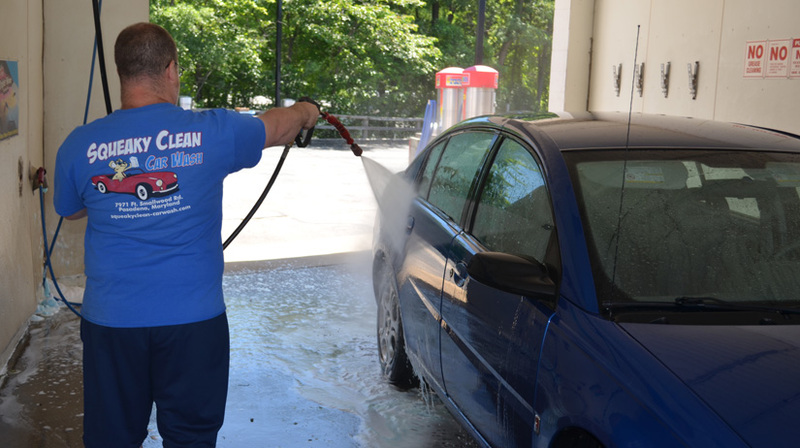 The transition to express car washes was made in an effort to serve more people, clean cars quicker and charge customers less money. Express washes reduced labor costs as extra services were offered before and after the vehicle made it through the tunnel wash self-serve. Flex-serve options also developed where customers got the best of both full-serve and express washes. It provided a fast wash at a low price along with the ability to tap into extra services. Nowadays, car washes are incredibly efficient. They treat the water used in each wash with reclamation systems that recycle it for future use. They also have high tech computer controls and high pressure nozzles that preserve water. Electricity costs have been cut thanks to solutions like regulators that reduce dryer cycles. The International Carwash Association estimates that over 20,000 car washes now exist across the world.